Percy Sutton Harlem 5K Run happening this Saturday, August 24 | HarlemGal Inc.
Feel like running this weekend in honor of Percy Sutton? 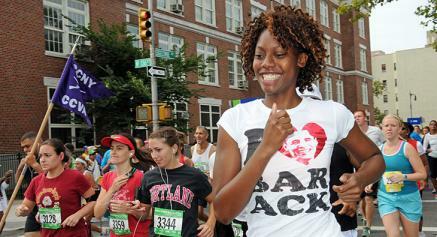 There is a 5k run happening in Harlem. The Percy Sutton Harlem 5k Run is taking place Saturday, August 24 and there is still time to register or make plans to watch. Click here to register. “This 5K race honors the late Percy Sutton, who as Manhattan borough president in the 1970s championed the New York City Marathon as a five-borough event and remained a supporter of New York Road Runners and running throughout his life,” according to its website. Percy Sutton passed away in 2009. The 5K course circles St. Nicholas Park and runs alongside Jackie Robinson Park. The finish line is at St. Nicholas Avenue and 138th Street, near the Percy E. Sutton Education Complex. This entry was posted in Community, Harlem, Harlem blogs, health and wellness, St. Nicholas Avenue and tagged Harlem, health and wellness, Jackie Robinson Park, New York Road Runners, Percy Sutton, Percy Sutton Harlem 5k Run, running, St. Nicholas Park. Bookmark the permalink.